Looking for a deal? Google it! The search giant (and up-and-coming global empire) has quietly introduced the ability to search for printable coupons in Google Maps. As local search blogger Mike Blumenthal notes, apart from some coupon-related domain names spotted last month, Google’s work on the service has largely stayed below the radar. 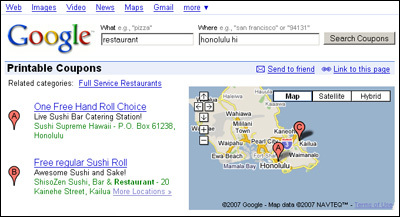 Nonetheless, its coupon search can be easily conjured up to find deals at Boston restaurants, specials at San Francisco dry cleaners, and yes, coupons for Honolulu businesses as well. Current offers include $2 off at Edible Arrangements, $50 off an Empowered Internet website, and 10 percent off an uncontested divorce courtesy Aloha Paralegal Services. Google’s coupon search picks up offers from providers like ValPac, but business owners are invited to upload their coupons directly via a Google Local business listing.